Well it’s time to tell you all what I’ve been up to all these months. Other than nursing a fairly heavy knitting addiction, I’ve been editing the 40 Below anthology. 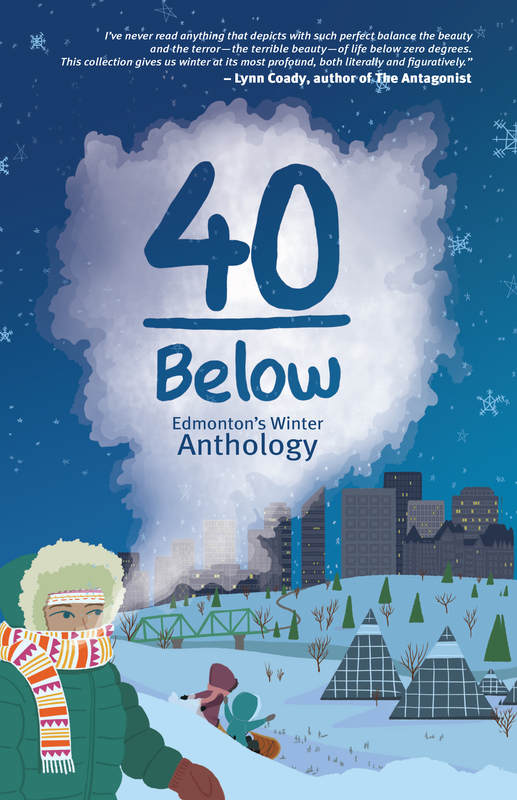 40 Below is filled with writing about or inspired by winter in Edmonton. A year ago when I first told people about this project and then announced it to the Internets I was worried that I wouldn’t get enough submissions to put out a decent product or that people wouldn’t even take the idea seriously enough and it would just die on the table. The timing turned out to be just right at I ended up getting a slow and steady stream of submissions. That turned into a huge downpour by the end of last year. The finished product looks better than I ever could have expected. The poetry is strong, the fiction is strong and the non-fiction is strong. I read each submission blind so I had know idea who was behind each piece. It turns out that some of the best writers in the city were sending their stuff in to my anthology. Writers like Michael Hingston and Jessica Kluthe, Diana Davidson, Thomas Trofimuk and so many more. I think that this book is a true love letter to the city of Edmonton. It tells our story like only we can tell it. Winter is a part of our lives in Edmonton and how we experience winter is what makes us unique. I am very proud of this book and I believe that it has something in it for every person in the city. Therefore, everybody should buy one. It will be in stores all over Edmonton on November 1st but you can order it right now on Indigo. The cover art was done by Jason Blower. He’s a great local artist and he does lovely designs that are fun and have a style all his own. It was fun working with him on this cover design. He’s a good boy and so popular right now! Below is a trailer we made for the book with a great song by Jordan Norman. The song is called 40 Below. If you like it please share it with your friends, pre-order the book, and if you need any other help or info then please get in touch with me so I can help you and/or change your mind. You can also order the book on the 40 Below website right now. You can contact me the same way that you wrote this comment. Go to 40below.ca for info. Unfortunately I cannot accept submissions by post.